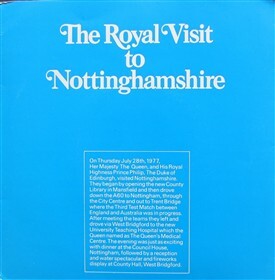 Text on Record label : The Royal Visit to Nottinghamshire. Ron Coles introduces highlights from Radio Nottingham's live broadcast on Thursday, 28th July featuring commentary by Dennis McCarthy, John Lilley, Alastair McDougall & Dandi Marshall. 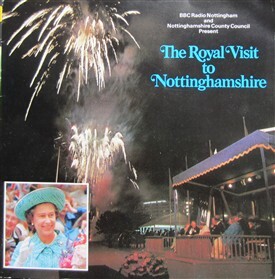 Text on Record Cover: On Thursday July 28th, 1977, Her Majesty The Queen, and His Royal Highness Prince Philip, The Duke of Edinburgh, visited Nottinghamshire. They began by opening the new County Library in Mansfield and then drove down the A60 to Nottingham, through the City Centre and out to Trent Bridge where the Third Test Match between England and Australia was in progress. After meeting the teams they left and drove to West Bridgford to the new University Teaching Hospital which the Queen named The Queen's Medical Centre. The evening was just as exciting with dinner at the Council House, Nottingham, followed by a reception and water spectacular and fireworks display at County Hall, West Bridgford. Text Inside Record Cover: Thursday 28th July was a very special day for Nottinghamshire and for BBC Radio Nottingham too. The local station broadcast its longest most successful outside broadcast ever, when it mounted a 10-hour marathon commentary. 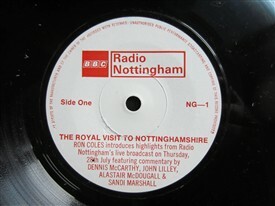 Six Radio Nottingham commentators reported from eleven fixed points and the radio car broadcast live on the move from its position in the Royal Cavalcade. Every available member of staff played and important role but the broadcasters were: Dennis McCarthy, Sandi Marshall, Alastair McDougall, Valerie Jones, Freddie Gaunt and John Lilley with Ian Gall and John Holmes in the studio. This page was added by Website Administrator on 02/07/2014.